Expressions of creativity can always lead us to a deeper level of understanding. 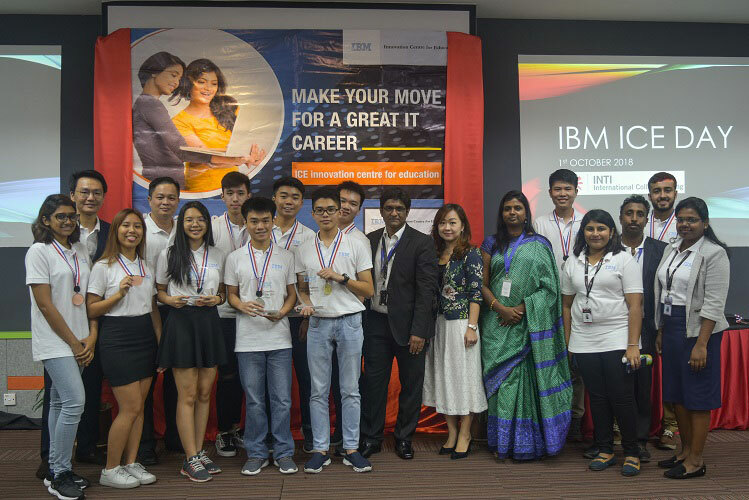 In encouraging students to deep dive into business analytics, cloud computing and web programming, INTI International University & Colleges (INTI) recently organised its first ‘IBM Innovation Centre for Education (IBM-ICE) Day’ which included talks by IBM experts and a poster competition. The event was held at three of its campuses in Malaysia, namely: INTI International University (IIU), INTI International College Penang (IICP) and INTI International College Subang (IICS). Proton Squad team from INTI International University Nilai, presenting their ideas before the judges. Being the first private higher education institution in Malaysia to offer programmes in collaboration with IBM, a global leader in digitisation, INTI organised this event for students across business, accounting, and computing & IT programmes which included IBM ICE modules. The cross-campus event enabled them to explore and creatively express what they understood from the core the IBM-ICE programme through their posters. The IBM-ICE programme is the first ever industry developed programme to be integrated into INTI’s curriculum. Introduced in 2016, INTI collaborated with IBM-ICE to offer practical modules across various programmes, including: INTI’s Bachelor of Computer Science (Hons) – Business Analytics; INTI’s Bachelor of Computer Science (Hons) – Cloud Computing; INTI’s Bachelor of Information Technology (Hons) – Business Analytics; Diploma in Information and Communications Technology, Diploma in Business and Diploma in Accounting. By including IBM subjects into these programmes, graduates will receive additional IBM badges which can be used as micro-credentials on top of receiving their academic qualifications. Students will also receive an IBM Academic Transcript upon completion of all IBM courses in their programme. 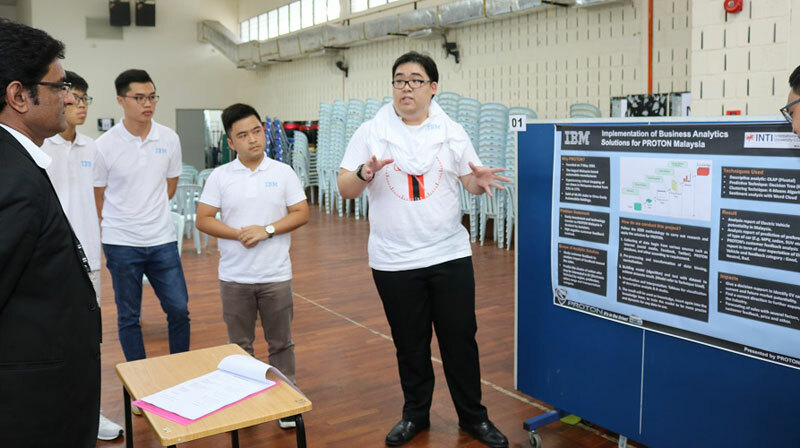 To mirror the content layout of the IBM-ICE modules, topics for the IBM-ICE Day poster competition were set according to the various areas of study, including: cloud computing and its benefits; business analytics and its applied aspects; internet safety; and e-business innovation. Besides creating a digital poster, participating teams also produced an artwork measuring 3 feet width by 4 feet length, to be viewed and assessed by the judges. The winning teams of INTI International College Penang posing with the academicians and guests of honour Anne Kee from IBM Malaysia (4th from right of front row), Viqaruddin Surki from IBM Malaysia and IBM India respectively. The poster competition as well as the overall programme of the IBM-ICE Day offered valuable opportunities for students to hear from IBM speakers, who discussed the key areas that are rapidly developing in the workplace. Students were also able to interact and connect with IBM leaders to find out more about the realities of today’s digital workplace. Among IBM’s guest speakers who were present at INTI’s campuses were Mr Yogeswaran Govindarajah, Shared Services Leader, IBM Malaysia; Ms Anne Kee, Malaysia Northern Region Manager – Clients & Partners, IBM Malaysia; Mr Hwai Sheng Loo, Education Leader, ASEAN Systems Technology Group, IBM Malaysia; Mr Vithal Madyalkar and Mr Viqaruddin Surki from IBM India. Through the messages delivered and shared by IBM leaders, students were affirmed in the increasing need for them to develop as young professionals who are familiar with fast paced and cutting-edge IT skills, and also saw the possibilities that lay before them in becoming technology leaders with IBM and IBM’s Global System ISV Partners. Looking at the fact that Malaysia’s rapid expansion of regional IT hubs in recent years has engendered an acute demand for talent in key positions, particularly in the field of big data, cloud services, and social computing , compounded with the goal of having at least 20,000 data professionals in the country by 2020 , there is an undeniable need for graduates to harness these skillsets for entering the workplace. “Additionally, in a survey conducted by INTI on the expectations of employers versus graduates, 30% of employers listed digital literacy as the most important competency for graduates to have when coming into the workplace,” said Dr Jane Lim, Chief Executive of INTI International College Subang, while delivering her welcome speech. The winning-teams of the above-mentioned competition at the following campuses were: Nilai campus – Proton Squad team with their poster titled ‘Implementation of BA solution for Proton Malaysia’; Penang campus – Hackascream team with their creative work titled ‘Types of cyber crimes’; and Subang campus – In Time team with their work titled ‘Benefits of IBM Bluemix’. Prizes were given out by Mr Timothy Johnson, Senior Vice President of Marketing, Product & Partnerships, INTI International University & Colleges and honorary guests from IBM Malaysia and IBM India.